"In the articles upon "The Doctrine of Justification" we contemplated the transcendent grace of God which provided for His people a Surety, who kept for them perfectly His holy law, and who also endured the curse which was due to their manifold transgressions against it. In consequence thereof, though in ourselves we are criminals who deserve to be brought to the bar of God's justice and there be sentenced to death, we are, nevertheless, by virtue of the accepted service of our Substitute, not only not condemned, but "justified," that is, pronounced righteous in the high courts of Heaven. Mercy has rejoiced against judgment: yet not without the governmental righteousness of God, as expressed in His Holy law, having been fully glorified. The Son of God incarnate, as the federal head and representative of His people, obeyed it, and also suffered and died under its condemning sentence. The claims of God have been fully met, justice has been magnified, the law has been made more honorable than if every descendant of Adam had personally fulfilled its requirements. "Arthur Walkington Pink was an English Christian evangelist and Biblical scholar known for his staunchly Calvinist and Puritan-like teachings. Though born to Christian parents, prior to conversion he migrated into a Theosophical society (an occult gnostic group popular in England during that time), and quickly rose in prominence within their ranks. His conversion came from his father's patient admonitions from Scripture. It was the verse, Proverbs 14:12, 'there is a way which seemeth right unto a man, but the end thereof are the ways of death, ' which particularly struck his heart and compelled him to renounce Theosophy and follow Jesus. 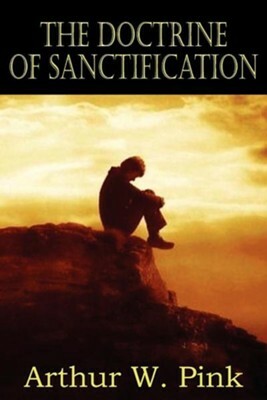 I'm the author/artist and I want to review The Doctrine of Sanctification.